“Why are Christians so judgemental?” “How can a good God allow so much suffering?” “Why should I trust the Bible?” These are some of the questions frequently asked by non-Christians. Do they throw you off? Well, if they do, not any longer. 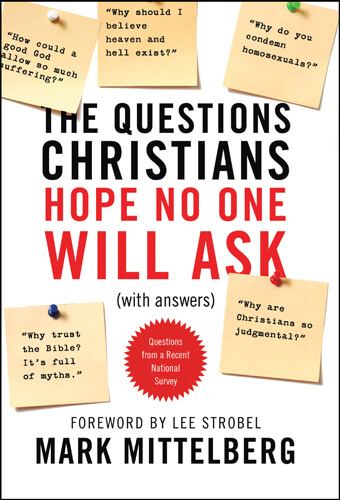 The book “The Questions Christians Hope No One Will Ask” by Mark Mittelberg purports to give all Christians a foundation for us to explain away the common doubts and misconceptions about Christianity. Each chapter of the book answers one of the top ten questions that Christians feel most uncomfortable about, from a survey by Tyndale House Publishers. The chapters are structure by first giving a detailed answer, a summary, and finally, a list of questions meant for group discussion, making this book very useful for a Bible study group, or even just for a discussion with your non-Christian friends. The chapter about “How could a good God allow so much suffering” incisively cuts to the point of the issue: that very often, the question is asked as an expression of pain and grief, and theological answers may not be the best. But although the book makes this point, Mark Mittelberg still gives a rationale answer. Other chapters that really opened my eyes were the chapters on “Why do you condemn homosexuals” and “Why are Christians so obsessed with abortion?” Although these questions are very controversial, I feel that Mark has cut through the smokescreens surrounding the issue, to show how we can offer the compassion of Christ without compromising our values. Using the interaction between Jesus and the Samaritan Woman as an example, he shows how we can exercise compassion and tell the truth about God’s will and intention for marriage at the same time. However, I do not agree with his chapter on evolution and the Bible, where his claims that Bible-believing Christians hold a variety of views on this issue (including old-age creationists and theistic evolution), all of them equally valid. I believe that if we do not trust the Bible on how old the earth is, or how God says he created the world, then we cannot trust what God says about his only Son Jesus Christ. We must either take the Word of God as a whole, or discount it as a whole. In addition, if God did use theistic evolution to bring about humanity, there would have been death before the Fall, making the need for Jesus Christ redundant. However, on the whole, I think this book is a very easy and reliable book. It’s useful for those who want to provide answers to their non-Christian friends and serves as a good primer to other books such as Josh MacDowell’s “The Evidence that Demands a Verdict”. Nice review. As far as your treatment of evolution, however — two points. First, a huge number of well-educated Christians believe that evolution and the Creation account are not incompatible. Denying this means disregarding the arguments of many intelligent people who have thought this through at length. And second, it’s simply not true that the Bible must be taken or discounted as a whole. There are many parts of the Bible that are clearly metaphor, and a lot of people would hold that Genesis 1 is one such passage. Just thought I’d throw in my two cents. Otherwise, nice review. This sounds like a good book – apart from the part about theistic evolution. I agree with you 100% there – if we trust what the bible says about Jesus, we have to trust what it says about how God created the world. Just something I’d like to say – Jesus didn’t come just so that our sins could be forgiven. The Bible says he was ‘the Lamb slain before time’. Even if we had not sinned, Jesus would have had to come here to fulfil the plan all members of the Godhead had for us. He came to earth to include us in God’s plan so that we could be sons of God. @Slightly Opinionated Nerd: I agree with you, but this book aims for breadth, not depth. But I remember reading books that were talking about the nature of Predistination. I think it’s a fascinating topic, but has to be treated with especial care, since we’re hypothesising about the “What-if’s” of God. Nolan, I have given thought to the creation and evolution compatibility, and there were two things that convinced me that it could not be so. First of all, in the New Testament there are several mentions of the creation as if it were fact, not metaphor. Secondly, I can’t see how death before the fall would fit in with God’s plan. I hope I don’t sound attacking to you, but I think it would be interesting to hear your thoughts on that particular aspect. Nerd, (is it ok if I call you that? 😉 ) that is a very interesting idea that I haven’t considered before. On the surface as presented it seems to make sense, however I’ll have to do some examining of the scriptures before I can believe it too. Caleb, on behalf of ITB. I hadn’t even considered the New Testament treatment of Creation — I’ll definitely need to look into that. Thanks! And I agree that death before the fall is one of those tricky questions that makes evolution difficult to fit into Christianity. I have no answer to that yet. The one thing that makes a young Earth hard to swallow for me, however, is radiometric dating, which is far more reliable than a lot of young Earth publications would suggest. I found this article really helpful in wrapping my head around radiometric dating: http://www.asa3.org/ASA/resources/wiens.html. I would love to always take the Bible at literal face value, but I don’t want to ignore evidence to do so. I think Christians are called to be discerning, and evolution is no exception. A thoughtful, well-written review of what looks to be a great read. Thanks! “Some people suggest that God used evolution to design the world. They are motivated, I think, by two impulses. The first is the desire to affirm the Bible. The second is a suspicion that Darwinism might have merit. Thus, they declare both to be true. “These two notions, however, seem incompatible to me. It may sound reasonable for God to “use” evolution, but if you look closer I think you will see the problem. Psalm 19:1 – The heavens declare the glory of God, the sky above proclaims his handiwork. If this were created by an evolutionary process, I don’t think the psalmist would call creation God’s ‘Handiwork’. To me that word implies careful planning and direct formation. Mark 13:19 – For in those days there will be such tribulation as has not been from the beginning of the creation that God created. These are the words of our Lord Jesus Christ. Although he isn’t addressing the issue at hand,the phrase ‘that God created’ seem incompatible with the process of evolution, even if it was guided. I also simply don’t really see a reason for God to have used evolution. After all, creation does bring him more glory which is his ultimate goal.